My first visit was in 2015. My friend planned our 10 day trip to Myanmar. I was flying out to join her for a quick three weeks backpacking around Myanmar and Indonesia before she headed home after her semester abroad. I let her do all the research. Something I find strange now that I plan all my trips myself! I quite literally did not know Inle Lake existed until it appeared on the itinerary my friend sent me. I was revising at the time and decided to have a well deserved break (I say well deserved but it probably wasn't because I had a tendency to binge watch Netflix during revision...) to research some of the places I'd be visiting. I typed Inle Lake into google and suddenly became super excited for my trip. Like the temples of Bagan, Inle Lake was a 'wow' place. I couldn't quite believe that I'd be visiting such places on my first ever backpacking trip. I've now been lucky enough to visit twice. Both times it was amazing. The scenery. The people. Everything. 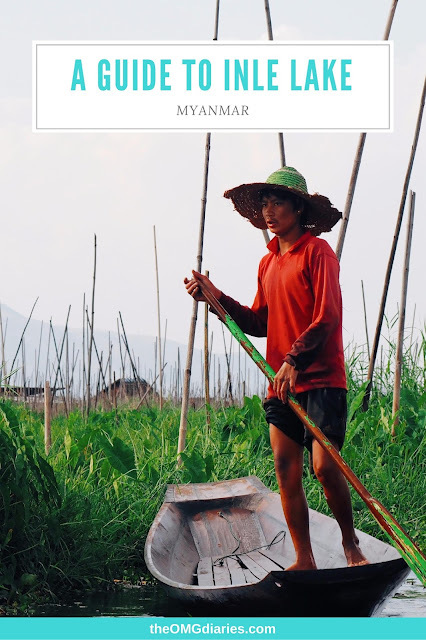 I'm by no means an expert nor have I fully explored everything in Inle Lake but I wanted to write a post about what I think you should see if you ever visit. The main option for transport to Inle Lake is bus/ mini van. On my first trip I took a mini van from Mandalay to Inle Lake. I think there is also a direct bus from Yangon and from Bagan. It's actually pretty easy to get around Myanmar. That is unless it's the water festival! But that's a story for another post. The bus was around 7 hours if I remember correctly and was during the day. We had to get out and change buses at the end just before entering the town. You have to pay a tourist fee before entering. This isn't something you can get around. I flew into Inle Lake from Bagan during my most recent visit. Very pricy considering the length of the flight and the prices of Air Asia flights but it had to be done because we quite literally could not get any transport because of the water festival. We looked into private taxis and no one wanted to take us. The one price we got quoted was as much as the flight so we figured we save the long car journey and treat ourselves to a short flight. At least we got a snack! If you're visiting the lake then you'll most likely be staying in the near by town of Nyaungshwe. This is where the boat trips start. I think you can also stay on the actual lake if you want but these are more resorts and I imagine they are quite pricy. I stayed in Aquarius Inn for both of my visits. It's quite basic but has everything you need. And the owners are super friendly, they were so happy to hear that I had come back to stay with them two years after my first trip. It's cheap and that was my main focus for all my accommodation in Myanmar. It cost us £16 a night so £8 each for a twin room with ensuite. Breakfast was also included and was one of the best free breakfasts I had in Myanmar. Free breakfasts are quite common in Myanmar but are very basic (to be expected) but each morning we had something different and were also given fresh fruit and a choice of drink. It's not as central as some of the other accommodation but it's still walking distance to where the boats leave to get to the lake. There's also a really good BBQ food place right next door and a bike rental place where you can rent a bike for the day for around a £1! I personally think seeing the lake and taking a boat trip should be your main priority when visiting the lake. If you're really tight on time then a day is enough to see the main attraction. The main attraction being the lake. You can easily do a full boat trip and cover the main sights. If you're really tight then skip the silver and cigar unless you want to see it or want to buy anything. I ended up buying a pair of earrings from the silver workshop, they were reasonably priced and great to wear when I wanted to look a little more dressy. Which is sometimes hard when you're living out of a backpack. Technically this is part of the boat trip. But not all of them. We specifically asked our driver to take us here and boy was it worth it! He wasn't sure if he would be able to due to the low water level but he tried and we managed to get there. The water level is something to bear in mind but it's always worth asking. We visited in April which was which was the end of the hot season. This village lies on the lake. It's not a floating village but rather an island. As your boat parks up you'll see a few stalls selling tourist items. There's also a market. We ended up getting a bit lost and ended up at a monastery instead of the Shwe Indein Pagoda which was the reason we chose to visit the village. It was worth getting lost though as we were guided by some local girls to another area with Pagodas. We had to climb up a bit of a hill and this also allowed us to find the Pagoda we were actually looking for! Entry was free but there was a 500 kyat camera fee. I paid it but I could of easily hidden my camera but I felt I should pay it. It's an amazing place to explore and relatively quiet. We managed to explore most of it completely alone. The Red Mountain vineyard and winery is located very close to the lake. If you take a bike ride around it then you'll most likely cycle straight past it. I haven't been myself. We quite literally cycled straight past it without realising. We weren't planning on doing any wine tasting but our guest house had told us that you could walk up and look at the view for free. I don't think the wine is great but it is Myanmar not France. It's pretty cheap though so if you fancy having a break from exploring the lake or having a relaxed evening with good views then it's worth researching. 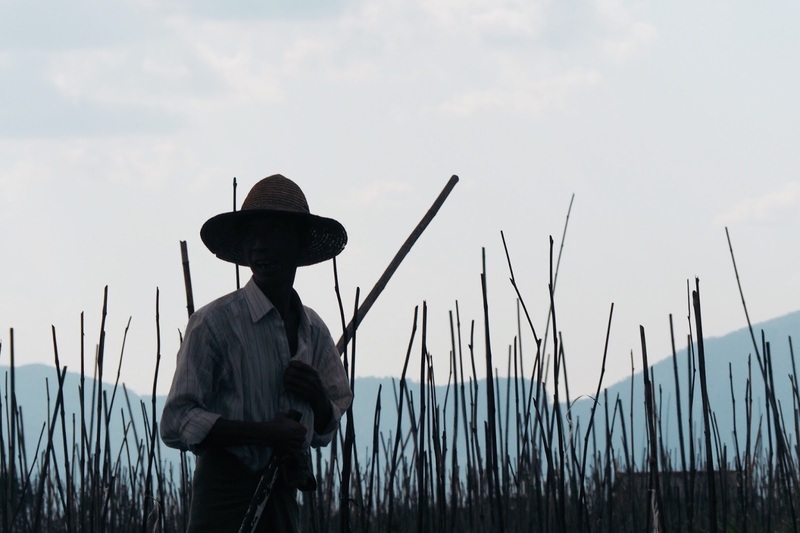 The lake isn't the only stunning thing in the Inle. The mountains and scenery that surround it also deserve attention. On our first day, due to a bad weather forecast, we decided to hire bikes and explore. We thought it would be better to battle the rain doing this than pay for a boat trip and not be able to see the lake. It was incredibly cheap. I think it was under a £1 to rent a bike for the day. They weren't the greatest bikes but they came with a basket so I was happy! Our guesthouse gave us a map and recommended a route for us. It was pretty easy to follow. We didn't see the lake for most of the first half of the ride. We then rode to a small village where you can pay to get taken across the lake. We paid 10,000 kyat for the both of us and were told by our guesthouse that this was a reasonable price. It's always good to know whether you're getting ripped off! The boat ride was fun although getting our bikes along the jetty on the other side was a bit awkward and there were plenty of locals to watch our struggle. I wouldn't recommend eating at the restaurant right on the jetty. It looks good but it's very standard food and there were place to eat along the road. We were worried it would be the only place to eat until we got back to the main town so ate there. If you're on a bike ride you'll most likely ride right past this. It's a great stop off for a quick browse and rest. The art here is pretty amazing. I didn't buy any mostly because a lot of it was rather big and we were only two weeks into a four month trip so I was trying to save buying souvenirs for later in the trip! I thought I'd finish with a quick note on where to eat. I didn't really note down any names or take any photos. We usually just went out and found food rather than searching on tripadvisor. 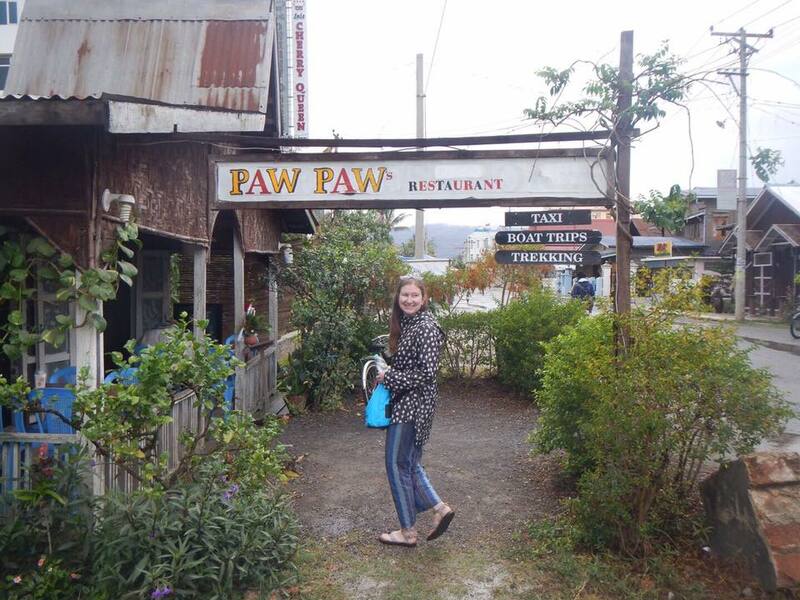 However, there is one place that I would 100% recommend and that is the Paw Paw restaurant. I managed to find one picture of me outside the restaurant! The restaurant is run by a lovely lady and her mother. Some of the money goes towards local children and a lot of the staff are volunteers. The whole story of the restaurant is on the menu. While the menu is rather small, all the food is freshly prepared and very good! After a lot of very bog standard meals it was nice to have a really tasty meal. It also worked out perfectly as it was just down the road from our guest house. If you get a chance then definitely visit. I think it opens for both lunch and dinner. It was very quiet when we went but it is very small so I can imagine in high season it fills up very quickly. The mains were around 5,000 kyats and the starters 2,000 - 3,500 kyats. They also served really good tea! Have you been to Inle Lake? What was your favourite thing about it?